Here are some questions which are frequently asked. If you have further questions, please mail info@manaslutrailrace.org and we’ll get back to you ASAP and also add it here. What will an average day on the race be like? How long do I have to complete each stage? How much stuff do I have to carry while running? I want to run for a charity of my choice? Can I do that? What kind of training should I do? Will there be medical facilities available? What about altitude? Do I need to prepare somehow? What is the terrain and trails like? How much money do I need to carry? Will the locals think we’re crazy? What about running at altitude? Do I need a visa for Nepal and how do I get it? Can I bring things not mentioned on the kit list? How much of my things will be carried by porters from stage to stage? Does this event give points for the UTMB? 1 What will an average day on the race be like? It depends on the length of the day in question. Normally we’ll get up at 6 to 6.30 – it’s the best time of the day! We’ll eat a light breakfast (maybe eggs, chiapati, pancake, porridge, tea/coffee etc), pack our bags for the mules, collect a packed lunch, and prepare for the start. Then we run to the finish! Simple! For short days, the start time might be later for you to explore the area a little. Where and when you eat your packed lunch is up to you. You’re welcome to stop along the way or wait until the finish. Then you’re welcome to explore the local surroundings, greet incoming runners, wash and change, drink endless cups of tea, play cards or maybe read a book or sleep. Around 4:30/5pm we’ll have official ‘tea & biscuits’ and somewhere between 6.30pm to 7:30pm we’ll have dinner. After dinner the race director will explain the coming day’s route and highlights. From experience, you’ll probably be ready for sleep around 8:30pm or earlier. 2 Where do we sleep? We’ll either be sleeping in tea-houses, the local hotels for trekkers. This area is not yet so well developed for tourism (improving rapidly though) and bed capacity can be low in places. Generally speaking you will sleep in a simple room, probably with bare walls and floor, on a wooden bed with a reasonably comfortable mattress. Blankets are also available. This should be enough for you to get good rest and recovery. 3 How long do I have to complete each stage? As long as you need. There are no cut-off times. It’s a running event, but you can also walk as much as you want or need. Note that the longer you take, the longer the sweeping team will be on the trail. 4 How much stuff do I have to carry while running? Short answer: enough to be safe in the mountains. While the routes are well used, and it would difficult to lose the way, it can quickly get very cold if you are only wearing sweaty running gear. In your backpack you should have – depending on the day – an emergency blanket, provision for water (water purification tablets), a small first aid kit and some food & enough warm clothing for at the finish until the mules or porters arrive with your bag. The point is to be safe, but to keep it fun, and running with a heavy pack is less fun than with a light one. 5 I want to run for a charity of my choice? Can I do that? Absolutely. The race will make a donation to the Samdo hydro-project and a solar light project in the areas between stage 2 and 4. Let us know who you wish to run for. 6 What kind of training should I do? Not everyone has time to do masses of training. We’d recommend a few things though. Firstly, where possible, add some hills (or stairs) to your training programme. Making sure you do downhill running once per week, and a long downhill once per month will strengthen your quads. Secondly, try to run often. A short run five days per week is often better than a long run a couple of times per week. Do some core fitness exercises, like planking – this will help with stability on rough trails. Try running with a full pack a few times too to ensure it fits well and is comfortable while running. Finally, standing on one leg with your eyes closed (60 seconds) is really excellent for strengthening ankles. 7 What food will be available? We’ll be serving traditional trekking food such as dal bhat (the Nepali national dish of rice, dal and vegetables), pasta, soups, potatoes, bread, fruits, eggs. We’ll try where possible to use fresh local goods. We’ll serve portions big enough to match your calorific needs. If you have special dietary requirements, please let us know. 8 Will there be medical facilities available? We’ll have a qualified medic hiking behind you with a comprehensive medical kit. In the case of emergency, a helicopter evacuation can be arranged if necessary. There are international standard medical facilities in Kathmandu. 9 What about altitude? Do I need to prepare somehow? There is no prior preparation for altitude possible. Being fit helps you to cope with the extra breathing you’ll have to do, and the extra physical work you’ll be doing. We’ve planned the days and nights to allow you to acclimatise adequately to cross the pass at 5,135m. We’ll advise you before the race, if you have not been to significant altitude before, about the symptoms of altitude sickness, treatment, hydration etc. You can read about diamox here too. 10 What is the terrain and trails like? The trails are largely very good indeed. They are in effect local highways along which everything is carried. You’ll enjoy running them! The crossing of the Larkye La will be a rougher trail and we might encounter some snow there – though working mules and yaks will be crossing the pass at this time until end of November. Best read feedback from others to assess this. 11 How much money do I need to carry? There is not really much to buy along the way. Beer, should you choose to buy it, will be the most expensive thing you can find as it is carried in. $10 per day will be much more than adequate for most people. We provide enough calories every day. If you want to buy additional extra meals in the afternoon from tea-houses you can. Do I need to bring energy bars, gels, powders etc. This is completely up to you, but you will not be able to buy many ‘energy’ foods along the trails. There will be biscuits and some chocolate available in small shops. There are good value muesli bars available in Kathmandu, as well as the usual chocolate items. 12 Will the locals think we’re crazy? It’s highly likely, but you’ll be a very welcome diversion! 13 What about running at altitude? This is a challenging one as it affects different people in different ways to different degrees. Normally the affects kick in at around 3,000m from where you should ascend about 300m per day with a rest day every 1000m – this is the guideline used that ensures the average person will acclimatise well and avoid issues. Acclimatisation has very little to do with physical ability. We believe our schedule is well designed and safe, as we spend four nights from 3,500 to 3,800m (and running is ok under 4,000m in my experience, harder, but not desperate as you might think) and our pass crossing is a fast up-and-over. It means we should avoid too many headaches and cross the pass easily. Whether this is ‘enjoyable’ for everyone is another matter! It is always more difficult panting for breath, but it is like saying running up hill is less enjoyable than running on the flat because it requires more effort. 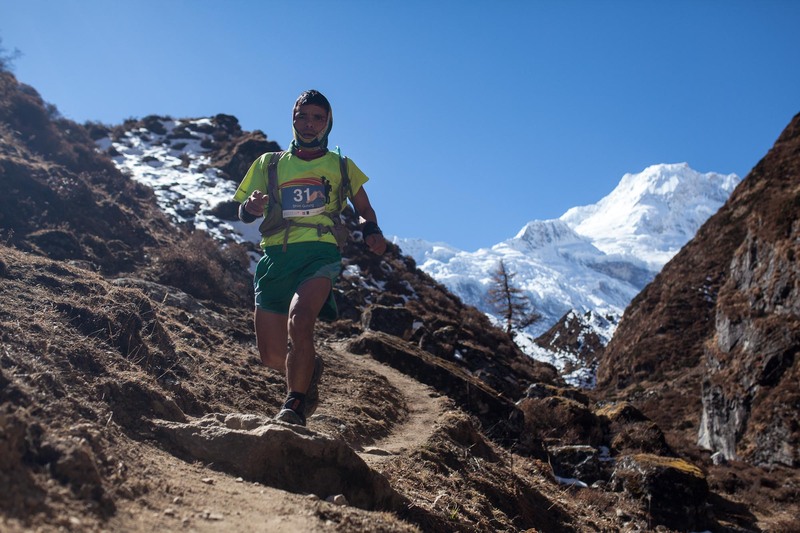 There is always a bottleneck to running speed and in this case it is oxygen.This route is much less taxing in terms of altitude than the Everest area treks and races where you’ll sleep for two nights at 4,900m and 5,100m – that’s high and uncomfortable! If you live at sea-level, it makes little difference in my mind as most people in the world, and probably all participants, will live way below 2,000m and thus start unacclimatised. You’re going to be very fit on your return to sea-level too. 14 What temperatures can we expect? Yes – it will be cold at Samdo at night, but with sleeping bags and the lodges’ blankets, plus a bit of nice thermal underwear on, and perhaps a warm hat, you’ll be waking up at 11pm sweating. It helps that the air is dry which reduces the air’s ability to take heat away. When the sun comes up, it’s really nice – shorts-weather even – and if a cloud comes, just put some trousers on! All in all, easily survivable! Plan for -10C to -15C for your sleeping bag. 15 Do I need a visa for Nepal and how do I get it? This is pretty simple for pretty much all nationalities. You can just get a visa upon arrival at the airport. Visa fees are $25/15 days, $40/30days and $100/90 days and have to be paid in a convertible currency but it’s usually cheapest in USD. You will also need a passport photo and either the pre-filled form, or a pen. 16 Can I bring things not mentioned on the kit list? Yes. The required items are needed for safety – you’re in the mountains after all. But you can bring other things that are not mentioned such as trekking / running poles and other gear, but aim to keep your pack under 10kg. 17 How much of my things will be carried by porters from stage to stage? In the morning you will pack your running bag with the things you need for the day. Other items (sleeping bag, books, other spare clothes etc.) can be put into a bag we will provide up to a maximum of 10kg. If you think you will have more equipment with you for whatever reasons, please let us know in advance. We will weigh your bag in the race hotel in Kathmandu until it reaches the target! We’ll make exceptions for your additional food / energy bars which will reduce daily. 18 Does this event give points for the UTMB? We’ve submitted the 2018 route and are waiting for confirmation from the ITRA. Looking for a stage race? Looking for a stage race in April? Try the Mustang Trail Race. April 2019 on the dry trails hidden behind the Himalayas. This is the sister race to the Manaslu Trail Race. Take a look! 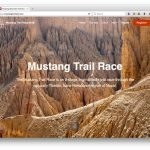 mustangtrailrace.com.